A central vacuum system consists of four main components. The vacuum itself is located in an easily accessible space. The ducts are inside the walls. The network is connected to the third component – vacuum inlets with flapper valves installed in various rooms of the house. The last component is the sweeper connected to the inlets. Central systems are easy to install in buildings under construction or renovation and are appreciated for their powerful suction and quiet motor operation. Our Electrolux, Eureka, Zelmer, Miele and Johnny Vac cleaners with bags compare very advantageously with their competitors. Using bags, the system can be emptied without putting you in physical contact with dust. With the appropriate accessories combined with the central system, you can efficiently clean wood, ceramic and carpet surfaces. A canister vacuum is a compact version of a central vacuum. A sweeper attached to a flexible arm is connected to the unit containing the motor and dust bag. This compact range is recommended for smaller homes like apartments and condos, or where opening up the walls to install ducts for a central system is problematic. As with central vacuums, Zelmer, Miele, Electrolux, Ghibly, Eureka and Johnny Vac are industry leaders in canister vacuums also. Our silent-operation canister vacuums efficiently clean wood, ceramic and carpet surfaces. If you’re looking to buy a vacuum cleaner in the Vaudreuil-Soulanges or the West Island, contact Aspirateur GB Plus, the specialist in central or canister systems! Luc Bisaillon, Owners, Aspirateurs G.B. Plus, are your vacuum specialists. 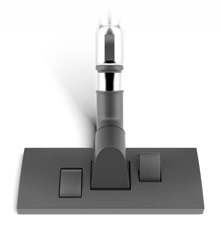 We provide the unit ideally suited to your needs and the surfaces to be cleaned.